French novelist, born in Paris on the 20th of January 1804. He was the son of a distinguished surgeon in Napoleon's army, and is said to have had the empress Josephine for godmother. Sue himself acted as surgeon both in the Spanish campaign undertaken by France in 1823 and at the battle of Navarino (1828). In 1829 his father's death put him in possession of a considerable fortune, and he settled in Paris. His naval experiences supplied much of the materials of his first novels, Kernock le pirate (1830), Atar-Gull (1831), La Salamandre (2 vols., 1832), La Coucaratcha (4 vols., 1832-34), and others, which were composed at the height of the romantic movement of 1830. In the quasi-historical style he wrote Jean Cavalier, ou Les Fanatiques des Cevennes (4 vols., 1840) and Latréaumont (2 vols., 1837). 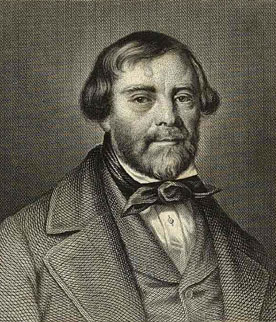 He was strongly affected by the Socialist ideas of the day, and these prompted his most famous works: Les Mystères de Paris (10 vols., 1842-43) and Le Juif errant (10 vols., 1844-45), which were among the most popular specimens of the roman-feuilleton. He followed these up with some singular and not very edifying books: Les Sept péchés capitaux (16 vols., 1847-49), which contained stories to illustrate each sin, Les Mystères du peuple (1849-56), which was suppressed by the censor in 1857, and several others, all on a very large scale, though the number of volumes gives an exaggerated idea of their length. Some of his books, among them the Juif errant and the Mystères de Paris, were dramatized by himself, usually in collaboration with others. His period of greatest success and popularity coincided with that of Alexandre Dumas père, with whom some writers have put him on an equality. Sue has neither Dumas's wide range of subject, nor, above all, his faculty of conducting the story by means of lively dialogue; he has, however, a command of terror which Dumas seldom or never attained. From the literary point of view his style is bad, and his construction prolix. After the revolution of 1848 he sat for Paris (the Seine) in the Assembly from April 1850, and was exiled in consequence of his protest against the coup d'état of the 2nd of December 1851. This exile stimulated his literary production, but the works of his last days are on the whole much inferior to those of his middle period. Sue died at Annecy (Savoy) on the 3rd of August 1857.